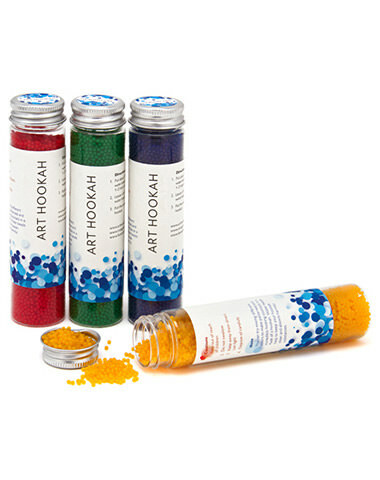 From the makers of the Art Hookah v4.0, these beads are a terrific way to add a little pizzazz to your hookah setup. Simply put a few beads in your base and add a little water and watch them fill your base with great colors! These Art Hookah Water Beads are easy to use and will provide you not only with a more colorful hookah setup, but also act as a diffuser, creating a cleaner, smoother, and tastier smoke. Available in several different colors, the Art Hookah Beads are tiny when dry; but expand in water to many times their original size, creating a diffusing effect that breaks smoke bubbles into smaller bubbles. Art Hookah Beads couldn't be more simple to use: just put about 10-25 grams into 1-2 liters of water (you can also put them directly into your hookah base). Leave the beads in the water for 4-6 hours, during which time they will expand. Once they are fully expanded, you're good to go! You can also mix and match different colors to create cool patterns inside your hookah base. Art Hookah Beads has a average rating of 0 stars out of 5 stars based on 0 reviews.